Utlängan is except for Utklippan the island furthest away from land in Karlskrona archipelago. It has been known among birders for its potential in rare birds. During four days a bird camp was hold at the island and the group saw a total of 137 species. At the top were yellow-billed loon, king eider and marsch sandpiper. Bohemian waxwings breed in the northern forests of America and Eurasia, but during winter it forage after berries often in large groups more sourtherly than there breeding grounds, for example in my hometown where I took these images a cold winter day. In the progress of eating to many berries alcohol is produced and in bad times they get intoxicated. Their call sounds like a "high trill sirrrr". Isolated on the southern point of Öland in the baltic sea. This nature reserve is to the area 995 ha. South of Karl X wall you find different habitats as forest at Ottenby lund, open moorlands at Västra mark, the meadows at Shäferiängarna and not to forget the coast with thousand and thousands of birds. One of the highlights is for me visiting during the peak of wader emigration with huge numbers of foraging birds along the beaches and bays. There are five breeding species of the grebe family in Sweden. They are all very good swimmers and can be found mostly in pounds, wetlands or lakes during the breeding time. Close to my home in a wetland 3 of them can be found, the great crested- slavonian- and little grebe. The other two are the rednecked that is far more a southerly species in Sweden, and the black necked grebe that has during the last years spread new breeding sites. But still has it strongest population at the popular lake Hornborgasjön in western Sweden. Here´s a collection of those species. 2000 meters high mountains, huge glaciers and deep valleys. With good company of Anton Lilja and Jesper Andersson this photo expedition was really nice, even if we didn't found either snowy owl or arctic fox that was our target of the trip. It was still fantastic to be in this wild nature. Here's some images from the Sarek National Park and surroundings of Laponia. As the elements water and sun - also wind has an incredibly power too change places into new characters. This is especially significantly close to oceans. However here´s a collection of images taken when there was a wind around 20 m/s. In this collection I have selected some of my most evocative images, often kind of abstract. During the﻿ years of being into photography I have more and more found this type of style in photography very interesting. Capture the atmosphere and feelings from the moment when the picture was taken in one single image. All images have been taken in the glowing light of the last sun rays of the sunsets or the first ones of the sunrises. A collection that literally follows a red line. In nature, there's a wide big world of interesting shapes and structures that often needs a whiles searching to find. In this collection I have chosen some of my most graphic ones, both of natures details and graphic bird images. This is my best memory from the trip to Ånnsjön in Jämtland. Witness the great snipes displaying with the sound of dropping a ping-pong boll against a table, at a middle high mountain, in a wonderful sunset with lots of different scenes and lights was just the dream for a photographer. It was sort of a magic atmosphere, here is a collection of selected images. Getting up at 03:00 in the morning can be very difficult, but usually its worth it afterwards. The fact that wildlife is more active and morning light turns places that normal during day looks boring into whole new places. Makes this situations maybe the most photogenic ones. This collection of images tak﻿en early in the mornings is a collection of images that in one way or another is associated with fog. During this trip with Jonathan Stenvall, sand somehow become everything. It was found in the tent, camera gear, clothes, food and even in my ears. It was basically unavoidable to stay away from the sand. But it didn't matter much, because it was the special sand landscapes we had travelled to see and photograph. This photo story is somehow connected to sand through the selected images from the trip to Gotska Sandön, isolated in the Baltic sea. During a week in middle of june, my family did a road trip through the beautiful landscapes of Provence. We started off from the airport of Nice and up northwest in France, many beautiful places with old villages both on the lowland and high up in the mountains.The last days was spent more south, along the cities at the coast. And a great ending of the trip was a short visit at the wetland Camargue with lots of birds, specially herons and egrets. The picture to the left took me all the way to London and the Wildlife Photographer of the Year 2014 awards. This collection shows more of the pictures I took at the same place. They have breeding for decades in old spruce forest and are known for being unafraid of humans. Probably as the bird has learn to search for people in the recovery of food, especially in the cold winter months. B&W increases the contrast most times, and shows a lot of details that not are shown in color. Overexposed pictures also works great in B&W. Most of the time I photograph in color because I like it most, but in some cases I have choose to convert the pictures into black and white afterwards. When the light hits a motive in front of a darker background, and the exposure is set to the motive, the background will naturally be almost black. There are also other situations where the underexposed pictures could work very well, a way to be creative in many situations. In this collection I have selected some of my favorite images that was underexposed with desire from the beginning the images was taking. Here´s a collection of images from the greenest months of the year. Especially in the cold winter months have a throwback to these images, makes them look so exotic with all the colors and teeming of life. A genre of images with, sometimes a painterly feeling. Most of these pictures have been taken in the early or late hours when the light is so low that being creative with long exposures often is the best option. Classical portraits can both be so boring, but also very interesting on the other hand. Here's a collection of different portraits mainly of birds taken during the last years. This season of the year offers a lot of exciting adventures and motives everywhere, maybe the best season after spring for nature photography... Just the fact that be able to photograph at dawn and dusk and sleep out well makes it even better. Here's a collection of pictures from the coldest months of the year in a single album. The fact that clouds always comes in new shapes and forms makes it interesting for photography, and how different kind of clouds can change places characters totally. In this collection there are images with focus on the clouds and skies. A family of birds I have been photographing a lot both because they are fascinating and interesting to photograph and also they appears both in my home area and to my latest photo trips in Sweden. Some species has been specialized and adapted to the cities and human activities in their way of surviving the cold winters or to breed in the spring. 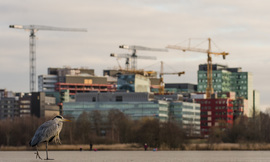 Sometimes fascinating how customizable some species are, for example the grey herons to the left. But we also need to see on the other hand how we totally destroy other habitats for our own cultivation or rampage. A photogenic motive as it white feathers makes contrast against other backgrounds. In this album there are images of both the more common mute swan and its relative whopper swan.